Hello there folks! Time for an update from one of our awesome Tampa Florida attractions here with things to put on your holiday to-do list! Busch Gardens is a one-stop holiday shopping destination, offering something for everyone on your gift list this year. Explore a variety of unique gifts including Adventure Camps, up-close animal tours, eco-friendly products and a memorable evening on the Serengeti Night Safari. Animal Wine Toppers – These charming little trinkets from Xcursions, Busch Gardens’ Conservation shop, are perfect for animal lovers and as inexpensive last-minute gifts. The animal figurines, made from recycled aluminum and scrap wood, top off a wine bottle once the cork is removed and can be purchased for $14.95 in the following animal styles: dolphin, elephant, giraffe, and sting ray. Proceeds from Xcursions benefit the SeaWorld-Busch Gardens Conservation Fund. Serengeti Night Safari – As the sun sets on the Serengeti Plain, its inhabitants awaken after the heat of the day to hunt, forage and explore. 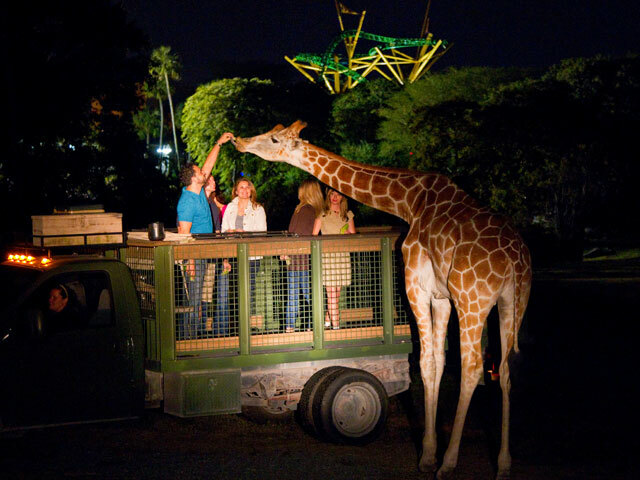 Now guests, too, can venture into the African night with the return of Busch Gardens’ Serengeti Night Safari, offering unique animal encounters, a campfire experience, and the opportunity to hand feed giraffes their “midnight snack” on the Serengeti Plain. Perfect for date night, team-building or a girls’ night out, the unique experience begins with heavy hors d’oeuvres and a selection of beer and soft drinks, where participants can get to know each other and their tour guides. The Serengeti Night Safari begins after sunset on select Friday and Saturday nights and costs $60 per person, plus tax. Guests must be 21 years of age or older to participate. For reservations, visit the Up-Close Tours page at BuschGardens.com or call 1-888-800-5447. Deco Breeze Decorative Animal Figurine Fan – These decorative animal fans from Xcursions, Busch Gardens’ Conservation shop, will brighten (and cool) anyone’s day. They are the perfect addition to any home décor and can be found in alligator, crab, elephant, fish, flamingo, frog, monkey, peacock, pelican and turtle styles, ranging in price from $69.95-$79.95. Proceeds from Xcursions benefit the SeaWorld-Busch Gardens Conservation Fund. Tiger and Orangutan Keeper Experience – Busch Gardens offers a behind-the-scenes animal experience perfect for the whole family. Join a Busch Gardens zookeeper to experience a day in the life of caring for Jungala’s Bengal tigers and Bornean orangutans. Participants have the unique opportunity to see where the animals sleep, help the zoo staff prepare the animals’ food and perform routine health exams. It gets better… the group also takes part in a one-of-a-kind orangutan training session and a unique tiger experience. The 90-minute experience is $199.95 for a group of up to 6 guests. Guests must be at least 10 years of age and 52 inches tall to participate. To reserve your adventure, visit BuschGardens.com or call the tour reservations center 1-888-800-5447. 2012 Busch Gardens Fun Card – With a 2012 Fun Card, you can “pay for a day, play all year” and never miss a thing at your favorite adventure park! It’s the best value for again-and-again access to all of the amazing animal encounters, world-class thrill rides, exciting entertainment and family adventure Busch Gardens has to offer all for the price of a single-day ticket. PLUS you won’t want to miss the debut of Busch Gardens’ all-new ice show, Iceploration, and your chance to go behind-the-scenes with our animal care experts in our new world-class Animal Care Center. The 2012 Busch Gardens Fun Card is valid from the date of purchase through Dec. 31, 2012 and is now available at the Busch Gardens’ front gate, on-line at BuschGardens.com or by calling 1-888-800-5447. Prices are $79.99 for adults and $71.99 for children ages 3 to 9. That&apos;s it for now, but stay tuned in for more updates on things to do in Tampa Bay and Tampa Holiday gift ideas!